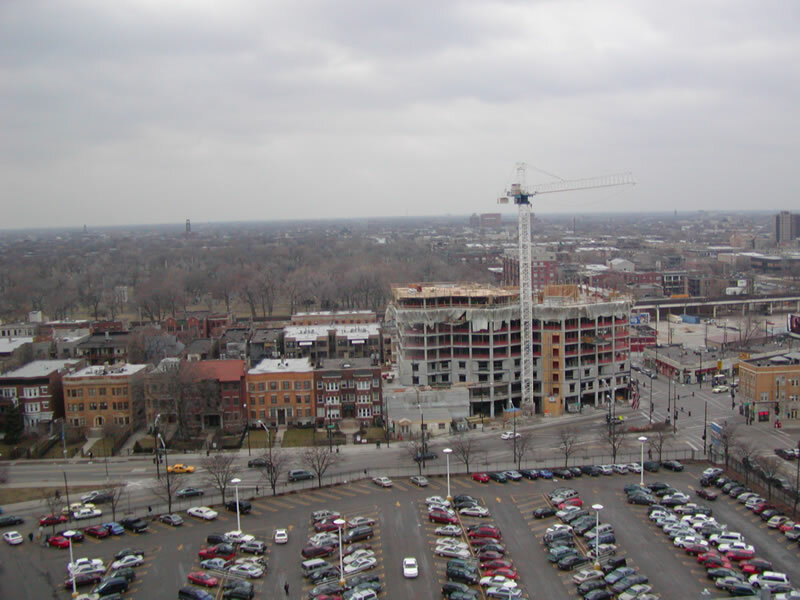 Here are some pictures of the move to Chicago on March 21 and 22, 2003. 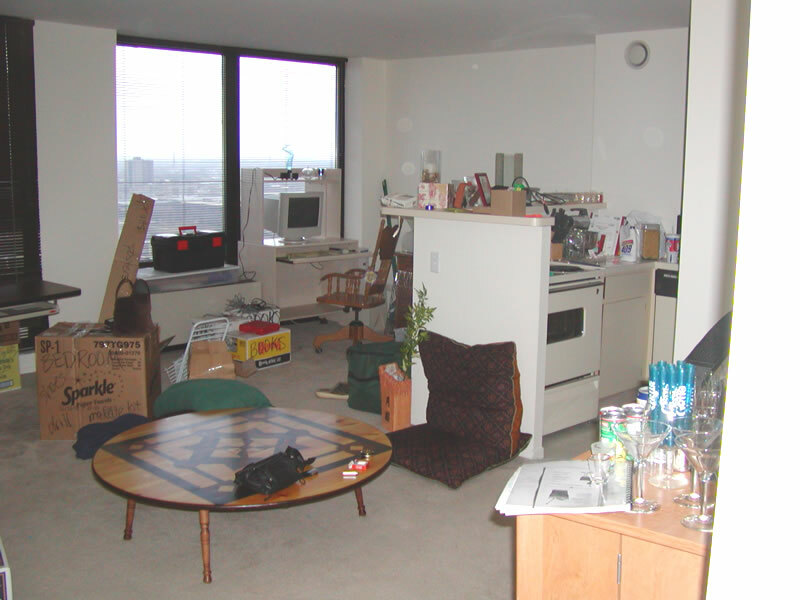 Actually most of the pictures are of her place and the view from the 16th floor. Rebecca arranged for a U-Haul trailer that was 6X12. I picked it up on Thursday and drove it to her house in Montevallo. She and Jared packed it, and we both agreed that Jared should get the "packer of the year" award. He got nearly all of her stuff into that trailer. A few things went into the back of the Jeep like her computer and television and clothes, but we had to leave a couple of items behind like a lamp and a small desk chair - we just could not fit them in! Click on each image to get a larger view. 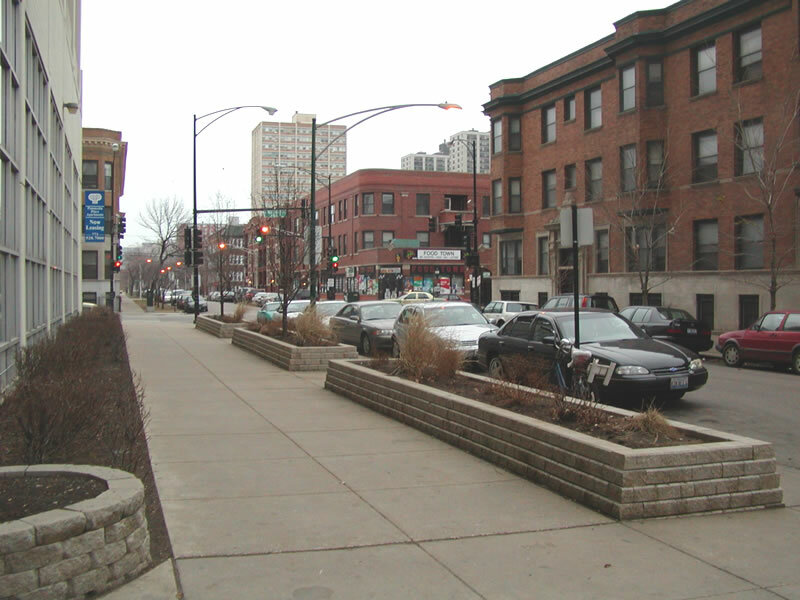 Street in front of Rebecca's apartment looking north. 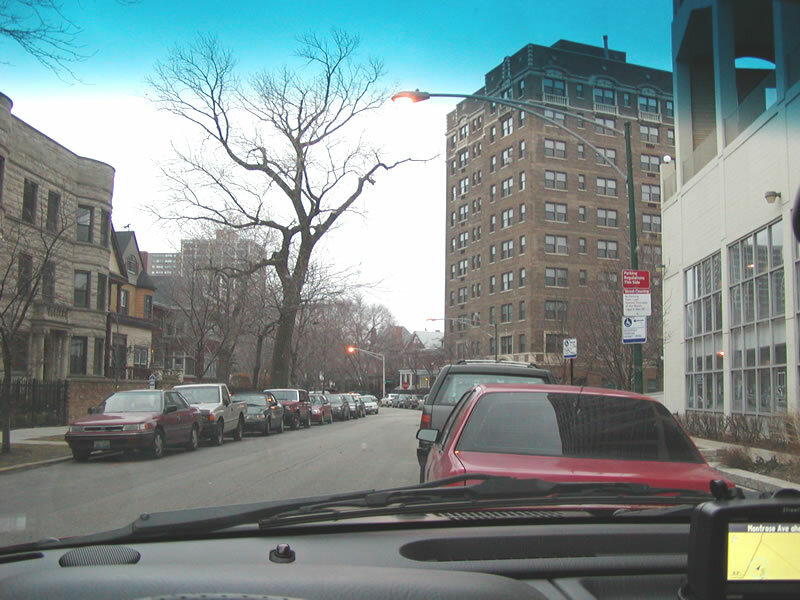 Street in front of Rebecca's apartment looking south through car window. 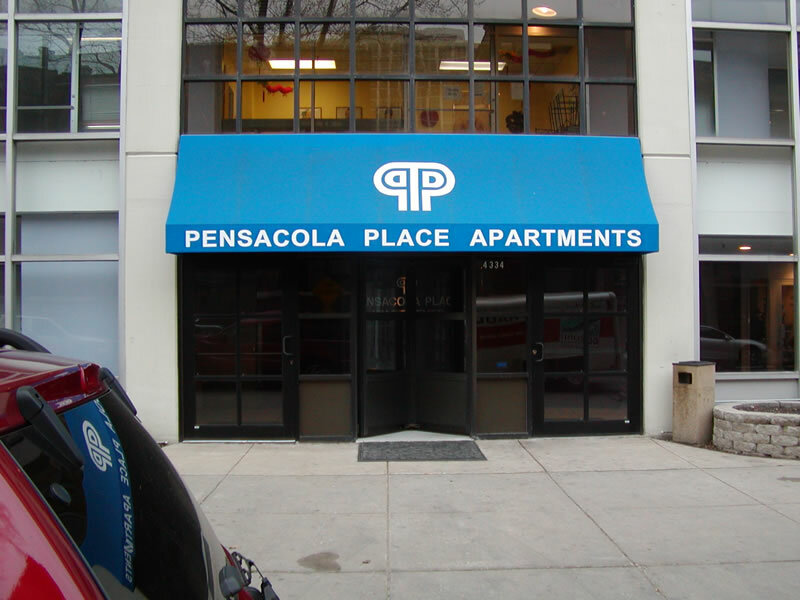 The main entrance to RCP's apartment complex. 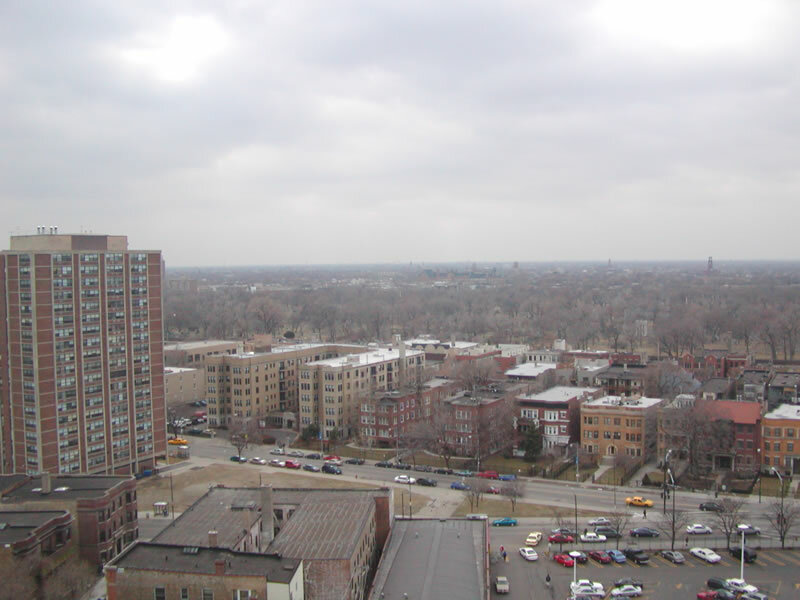 Her apartment is on the other side of the building looking west. 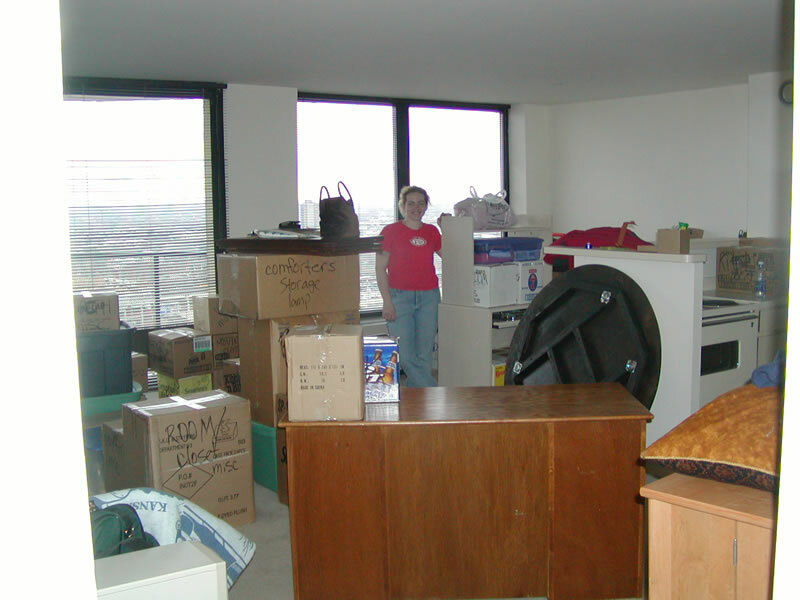 RCP with most of the stuff in the apartment - putting everything away was the next order of business. 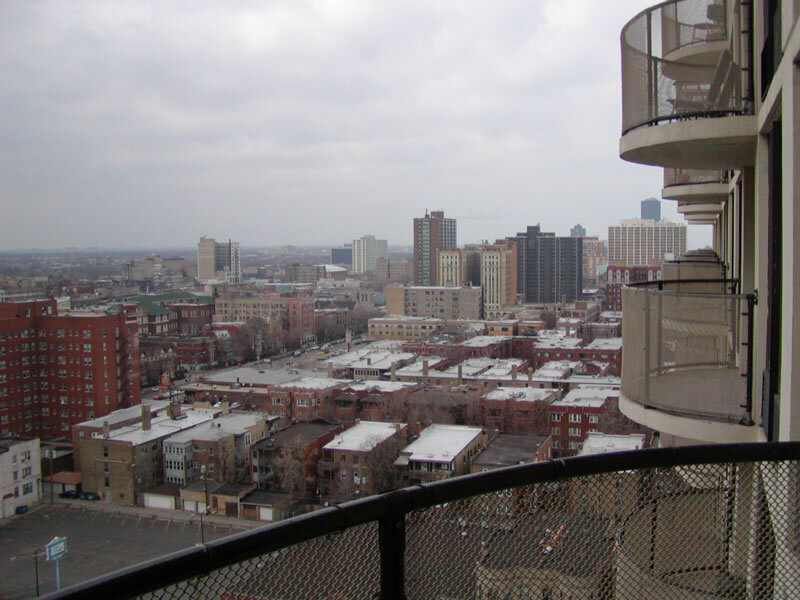 View of RCP's side of the apartment complex. Businesses are in a building right below her apartment. 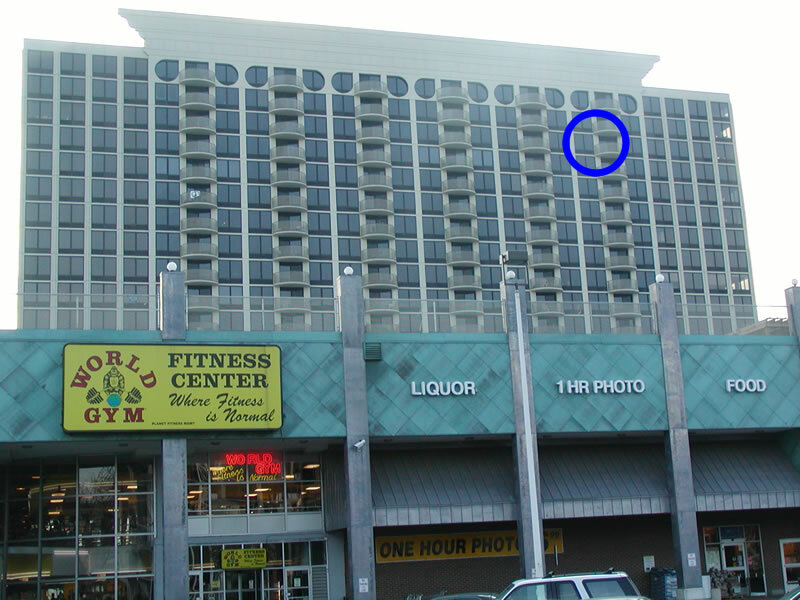 Her apartment is in blue circle in bigger image. View of RCP's side of the apartment complex. 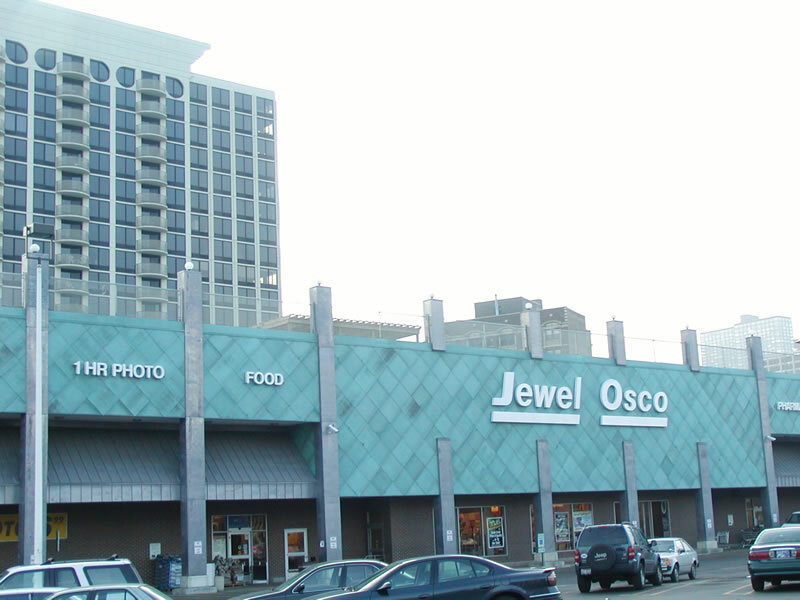 Tennis court and pool are on top of the Jewel Osco, grocery store. 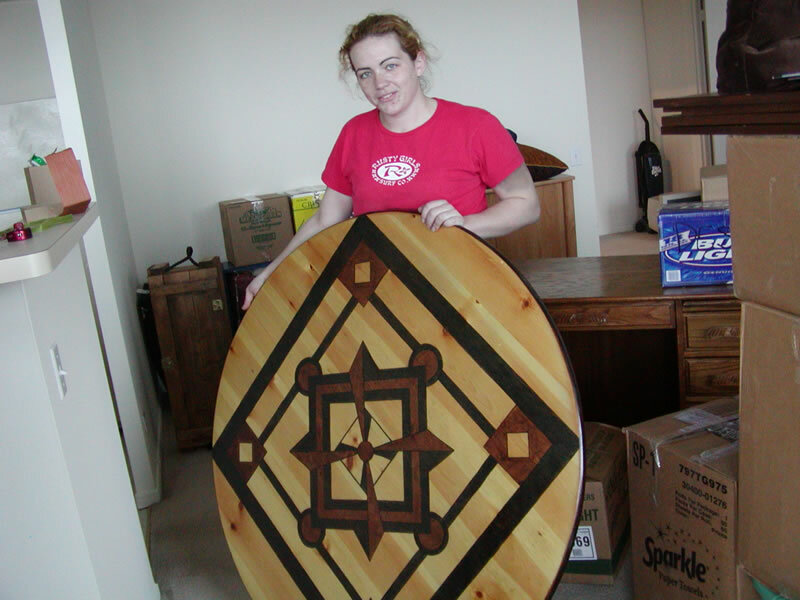 RCP with the dining table she refinished. Design is an original by one of her roommates. 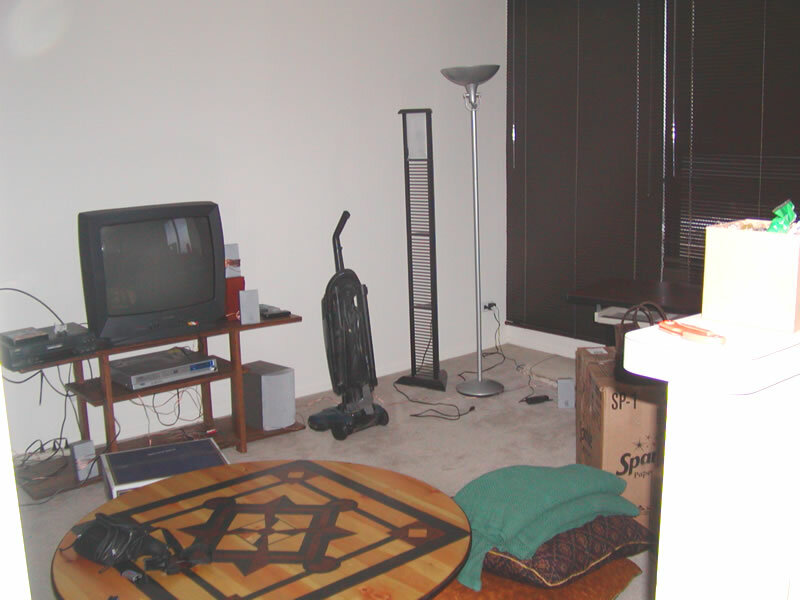 A view of the apartment looking toward the front entrance. Kitchen just to left. View looking from kitchen across living area. Door to balcony just to right of lamp near center of picture. 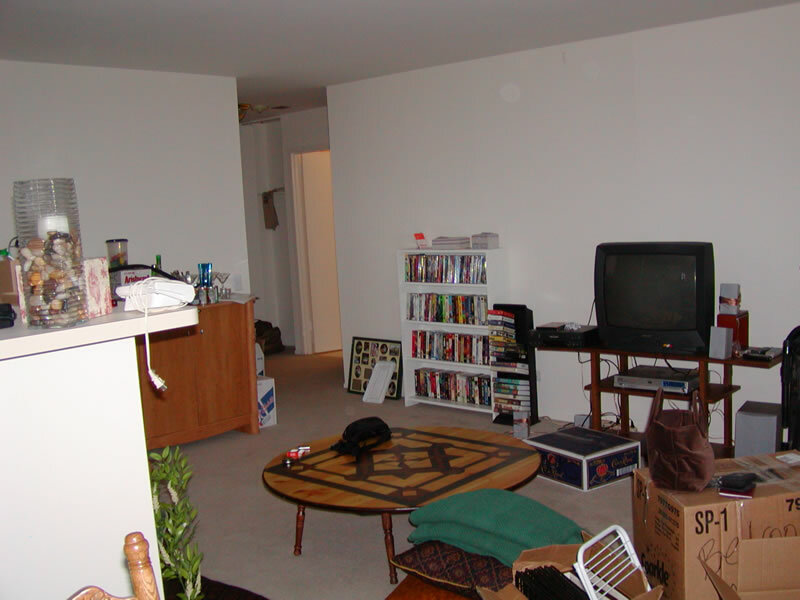 View looking from front entrance across living area toward office area. Kitchen to right. 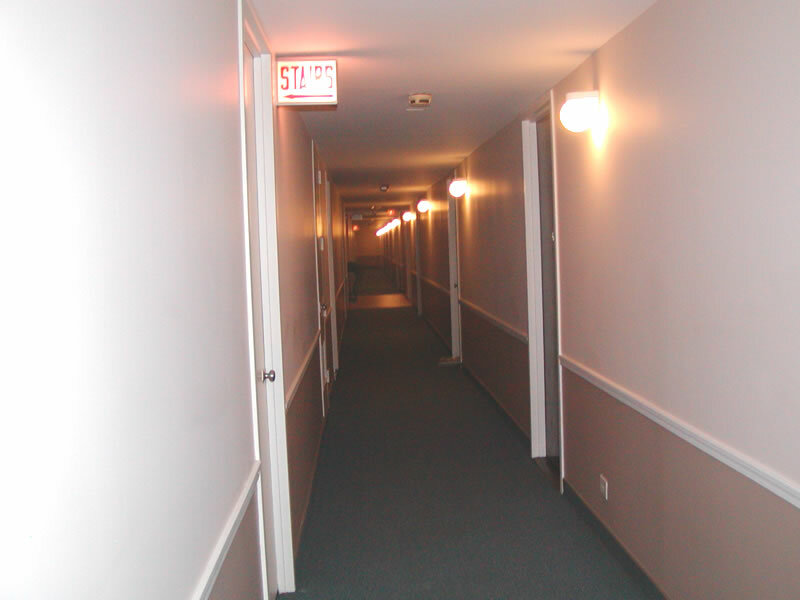 Hallway looking from RCP's apartment toward elevators (where floor color seems to change). View 1from RCP's balcony toward the south. 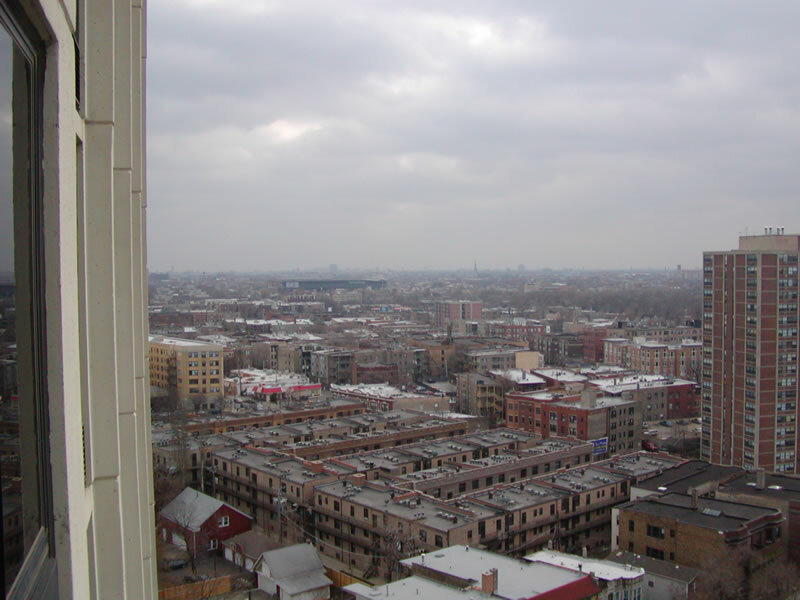 Wrigley Field is just to the left of the middle of the picture. View 2 from RCP's balcony toward the southwest. View 3 from RCP's balcony toward the west. View 4 from RCP's balcony toward the northwest. View 5 from RCP's balcony toward the north. 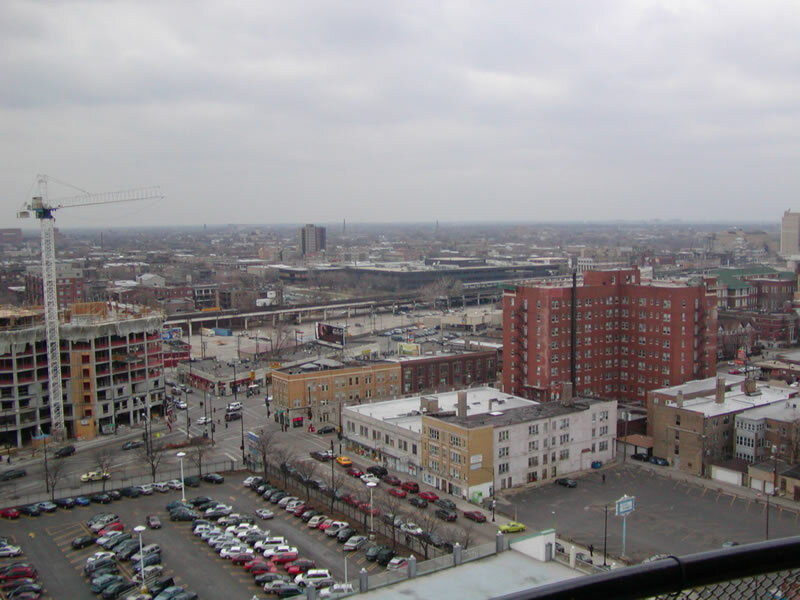 Complete panoramic view from RCP's balcony (large file - about 300k).